" Hello. US,Elyansun & Valérie.L, want to report what we saw.We Swear on our Honnor that these videos are genuine, so is too our testimony ! We were standing my mate and me surrounded by about 20 policemen, when the one with we talked with said " What is this in the sky". At his words we looked up our eyes to the sky and saw what You can see on these videos. We took the phenomenon on tape with 2 differents cellulars and with 2 slightly different Angles. During this observation we were surrounded by about twelve policemen, No Joke !!! " A Paterson, New Jersey, USA le 10-05-2012 (A resident of Paterson, NJ became frightened Thursday night when several UFOs were spotted hovering nearby. Luckily, the quick-thinking person had a cell phone handy, and was able to capture some fairly interesting flying object footage. What are these strange lights? The encounter occurred in the early morning hours of Thursday. The unidentified Paterson resident felt and heard "pulsating waves of sound," and observed huge lights descending from the sky. The video is very inconclusive, and frankly, the camerawork is pretty shaky, so the weird lights could have a very simple explanation. Considering Paterson is only about 20 miles from New York City, which would be a prime location for alien visitations, it's worthwhile to note this sighting. Paterson seems like pretty mundane place, otherwise, so why would it be a place of interest for extraterrestrials? 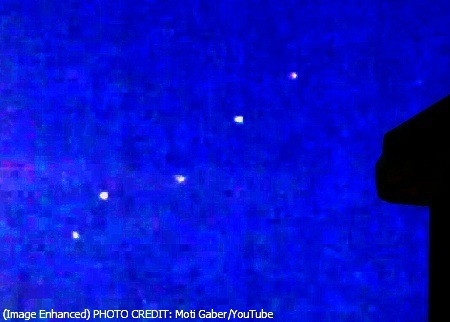 The new UFO footage deseves a quick look, but is not worthy of any type of formal investigation. 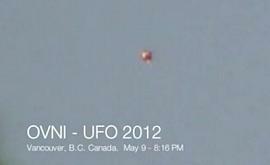 You can view the UFO video here.